I did a lot of shouting today. Chanting, actually. 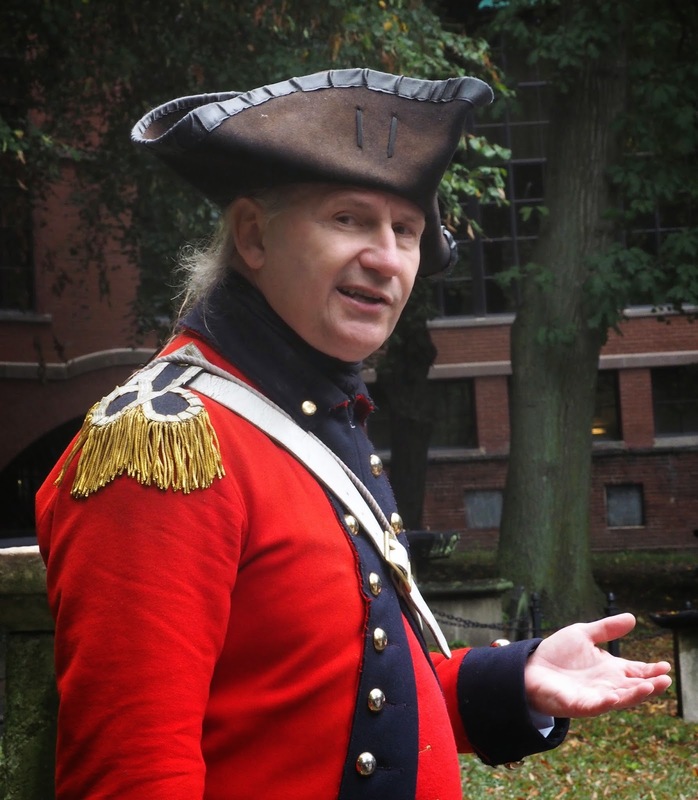 It was a day off from travel writing, there was no communication with Visit Boston, no itinerary, no VIP pass, no freebies. Instead I enjoyed the novelty behaving like a regular tourist: no rush to get up, a leisurely breakfast in the Gold Lounge here at the Fairmont Copley Plaza, and then a day of down time. Except that the reason for the lack of regimentation was that today was all about the rhino, and the Global March for Elephants and Rhino in 130 cities around the world. Our Rhino Warriors from last month's Youth Summit in Zululand were speaking at the rallies in Auckland and Wellington, Pete the Imake a Difference founder was at the huge march in London, and I was here in Boston, assembling on the Common with a somewhat small - but compensatorily enthusiastic - gathering of around 150. Never mind. As I said in my speech afterwards (as the only speaker on the rhino team, I was especially glad to be able to weigh in) you never know who or what you might inspire, simply by talking about the issue. 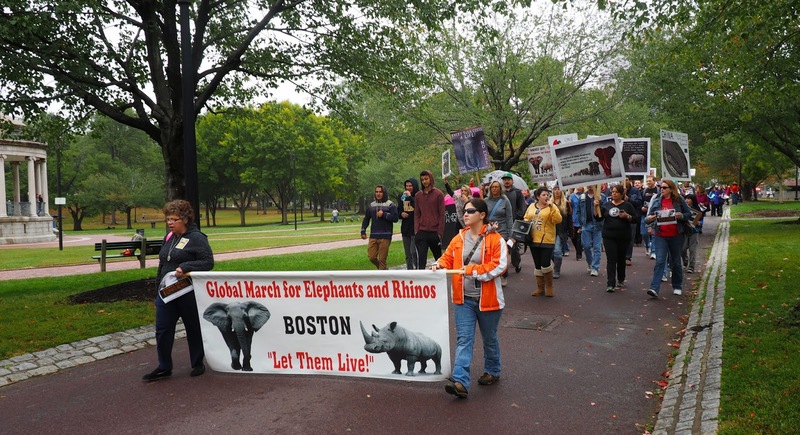 Some people clapped or gave the thumbs up as we marched around Boston Common for 45 minutes, holding our banners high and chanting: Extinction is forever; China stop carving ivory; Rhino horn is not medicine; Every nine hours another rhino dies. Who knows who we might have moved to do something? And we certainly fired ourselves up another notch. 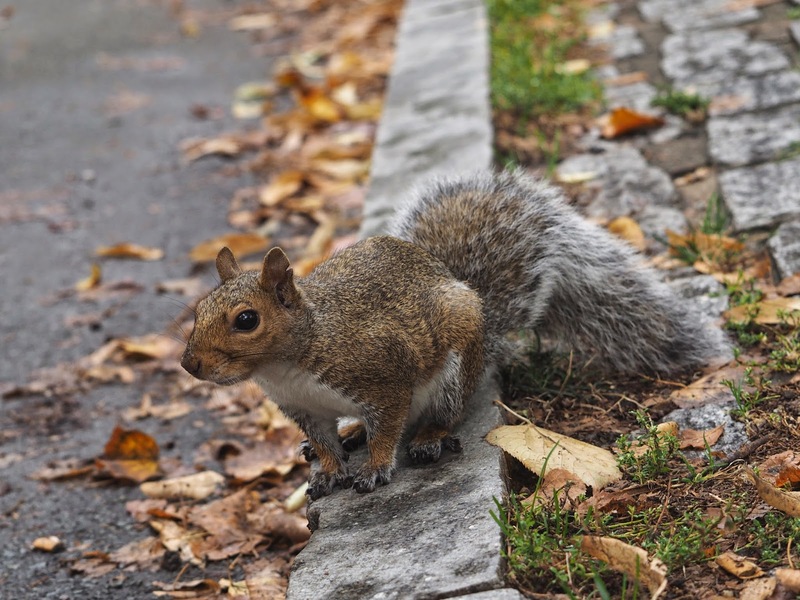 Though the day was meant to be all about elephants and rhino, I have to admit to being diverted by the squirrels. Here in Boston they're big, busy and very bold: darting fluidly around the pretty Public Gardens and the more open spaces of the Common. One stood for ages on his back legs, watching in astonishment as we paraded noisily past; but most of them were fully occupied in gathering acorns and tucking them into clumps of grass, or darting up tree trunks with their cheeks bulging. Very cute: I can't imagine ever seeing them as another sort of rat. Some unrelated bullet points from today: a serious game of Quidditch being played on the Common; gas lamps along the street in Beacon Hill, the brick buildings looking just like the Inner Temple in London; people flocking to a Boston Bruins ice-hockey game; that same game being shown on the TV above the bar in the Fairmont's Oak Room, which is otherwise stately and elegant; disappointment with the lobster and the Boston cream pie, neither of which was particularly tasty, though the Parmesan-crusted corn on the cob was delicious, even if it meant I couldn't smile for the rest of the evening; the shiny brass Make Way for Ducklings statues in the Public Gardens, from the story I often read to my daughters which I guarantee neither of them will remember; and a Freedom Trail guide who looked just like a moonlighting-in-hard-times Liam Neeson. It's nice to be back in Boston. As ever, it's a shame there's not time to give the city its due - but at least today I was using it like a local, I suppose.